Eric Godard was a healthy scratch for the third consecutive game, to make room for Maxime, Maxime the French Canadian Dream. A Rupp-Crosby-Fedotenko line was on ice for the starting face off. Marc Andre Fleury starts his antics early with a nice flashing glove on a second chance shot by Regin. Chris Phillips goes to the penalty box at 3:11 for holding. Pens at this point are 0 for their last 10 on the PP. A Billy Guerin backhander skips past the goal line, almost drawing first blood. A possession later Sid hits the post with his wrister. The Pens moved the puck very well with great puck possession, and it pays off. Sid finds “Back Ally” Geno with the good old back door pass at 4:37 [0-1] Crosby and Gonchar with the assists. Finally a PP and Geno goal! Rupper goes to the box for hooking at 5:01. Free Candy literally run Cheechoo over in front of Fleury at 14:39 of the first. Kovy misses a wide open cage with about 40 seconds left on their PP. Volchenkov goes to the sin bin at 9:09 for hooking. A Geno slapper deflects wide. 1-2 on the PP. Impressive looking second PP though. Anton Volchenkov gets the Sens on the board with a slapper right off the face off from 60 feet [1-1]. The shot ended up deflecting off of Jay McKee’s stick. Time of the goal 13:05, Regin with the helper. Fleur makes a great pad save through traffic on a delayed penalty call. Tenk goes to the sin bin at 15:30 for roughing. Danny Alfredsson gets destroyed by the shoulder of Craig Adams. He did not return to the game. Michalek goes after Addsy, tackling him to the ice with 4:09 left in the first. Michalek goes to the box at 15:51 for roughing. 4-on 4 hockey now. Geno and Gogo go on a short handed break but the pass from Geno skips over Gogo’s stick. The Pens get a good shift in as Sid sets up Geno for his thought to be second of the night, but the ref blows the whistle and the goal is disallowed due to a delayed penalty. Tenk goes to the box at 18:03 for slashing. The fans didn’t like that call because they, rightfully so, thought there should have been a call on Phillips for cross checking Sid. Fleury gobbles up a Kovy shot from point blank. Jonathan Cheechoo goes to the sin bin for boarding at 18:42, more 4-on-4. Both teams ended the first period playing some very physical hockey. The Pens were out shot 24-9 in the first. Cheechoo opens up his second period of play by heading to the penalty box after blind siding Malkin and hitting him with the high stick 50 seconds in. Chris Neil goes to the box for charging at 2:43, Rupper also goes for sticking up for his teammates. 4-on-4 hockey. Fisher walks in on Flower but Fleur shuts the door on him. Back to full strength Kovy gets a crack at Fleur, but the Flower stands tall on him as well. A gritty shift gets going for the Pens as Staalsy throws a nice shoulder in Kovy and takes off with the biscuit. Staalsy does a little give and go to Tenk for Pens third goal at 7:15 [1-3]. Talbot is credited the other assists. Great work by Staal on this goal. Jay McKee finds himself making a trip to the box for tripping at 8:16. Flower shows he can use his stick with a sick stick save on Picard. PP killed. Fleury makes another nasty save on Chris Neil who was sitting on his doorstep. Donovan goes to the box for goalie interference at 12:27. Another beautiful pass form the veteran Billy Guerin to set up Geno for a shot that rings off the post. 2 shifts later, the Pens go on a 3-on-1 after a give and go pass form Geno. Sid take control of the puck, passes it to Kuni who gives a little drop pass to Dad. Yep you guessed it. DAD SCORED! [1-5] PPG at 13 :57. Sid and Kuni with the helpers. Chris Neil takes a shot at the face of Jordan Staal who is wearing a full face mask….what a joke. Chris Kunitz, who is now a mad man on the ice, causes on turn over in the offensive zone and sends a pass over to Geno for the one timer. [1-6] Time of the goal 18:27. Kuni with the lone assist. Pens end the second with a great period of hockey; 38 saves for the Flower, Billy G had 7 SOG and Geno had 5. We get a fight to start the third. Rupper and Neil go at it right after the faceoff. Both got their jabs in. Brian Elliot is in goal for the Sens now. Addsy throws it down with Matt Carkner. Addsy wasn’t so heavy there. The gritty Sesame Street line comes out on the ice to cause some havoc and set up a beautiful goal. Matt Cooke receives the puck off the end boards from Staalsy and dishes it right to the pressing Papa Sarge at 1: 43 [1-7]. Cookie and Staalsy with the helpers. The trick was calling Geno’s name as he sends a shot wide on Elliot. TK goes to the penalty at 4:30 for holding. Talbot with a beautiful short handed move almost scores. Donovan gets a game misconduct for going after Cookie at 8:11, as well as a unsportsmanlike call which was served by Neil. Fans start chanting “Let’s Go Guerin” as Billy G looks for his 3 of the night. Dad ends up in the box at 9:18 for two many men. Staalsy and Dupes get a nice looking short handed chance but the pass from Dupes is cut off. PP killed. Billy G back on the ice was waiting on the doorstep of Elliot who robs him of his HT. Volchenkov goes to the box at 13:42 for tripping. A “We Want Guerin” chant echoes throw the arena. Kelly scores off a wrister at 18:09, whatev. Winchester and Cheechoo with the assists and that was all she wrote! PP was on FIRE! finally huh? Pens found a Power Line tonight in Kunitz-Malkin-Guerin with 11 points! 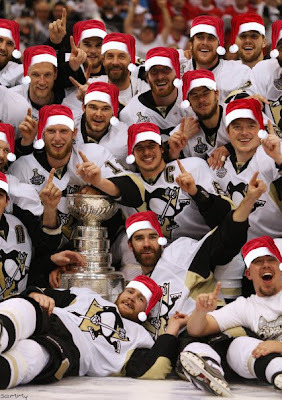 We here at PU would like to wish all of you a very Merry Christmas and a Happy Holidays!